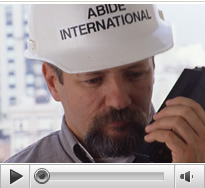 Abide International is a Building & Heavy Civil contractor with 30 years of federal government construction experience. At Abide International we have a Bonding Capacity of $35M single project and $100M aggregate. If your project is a bid / build or a design / build procurement, we can handle it. Here are a few samples of landmark and significant projects we have completed. Delivering large scale projects means managing risk day-in and day-out. Our commitment to superior performance demands the utmost caution and diligence possible while maintaining high standards. Learn how we handle quality every day. project control, delivery and execution.